Another very suitable candidate for our fish bowl is ghost shrimp. 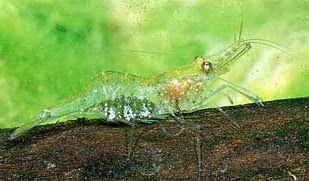 This shrimp is also called as glass shrimp or glass shrimp. Prepare the bowl as described in my earlier posts. In the container provide sufficient fancy plants or rock wood for the ghost shrimp to cling on to. The female ghost shrimp carries pink/green eggs on the underside of its carapace and may release the babies in the ornamental bowl. The babies should be separated as the mother ghost shrimp may feed on them. Rearing the babies is difficult as they are to be fed with brine shrimp hatch lings. As the ghost shrimp is omnivorous it will eat on the algae and other detritus in the ornamental fish bowl. 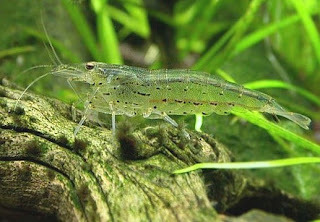 Pellet or flake food can be given to the ghost shrimp, in smaller quantities, so that the water in the ornamental fish bowl does not get polluted. Ghost shrimp can also be kept in the bowl along with small fish like guppies.